A raised cut relief in a gemstone or a shell is called cameo. By the different colourings of the raw material in layers or by the 'height', the shown motive contrasts mostly brightly with the deeper basis. Most jewellery cameos originated from shells. Nevertheless, nearly every and carveable material used during the antique jewellery production had been refined to cameos. The cameo appears in the antique jewellery also in alternative spellings, like kameo, cameo and camée. We introduce you to the variously used materials here. Stone cameos are carved mainly from agates. These banded layer stones were predestined for the cameo carving. Onyx, sardonyx and cornelian are the most often appearing variations. The treatment of these materials is much more difficult than with softer materials, indeed, the result is also much more detailed and is finer than with softer materials. Shell cameos became more popular about 1800 again, after their manufacturing experienced a decline in the time after the Renaissance. Shells are softer than layer stones and are easier and therefore and quicker to work on. The woodcarvers chose shells with ideally 3 layers to create the illusion of a most possible three-dimensionality. A big biodiversity of shells enabled a big colour variety in the jewellery creation. Since antique times the coral is a talisman against evil spirits and has originated after the legend when Perseus had killed Medusa and her blood flowed into the sea. The coral, which was mainly used in the jewellery creation, was ‚corallium rubrum‘ whose colour spectrum ranges from dark red up to the brightest salmon tones. The coral was treated always a lot more sculptural than the relief-like presentations on the shell cameos. A curiosity of a special kind is the so-called lava jewellery in the cameo carving. Actually, it is limestone, which was extracted at the foot of Vesuvius and was sold for marketing-technical reasons as lava. Since the 1840s it was a popular tourist jewellery for wealthy travellers on the Grand Tour. Lava cameos fascinate by their very big three-dimensionality and emit therefore an amazing liveliness. The opposite of a cameo is a gem. With the gem the motive is cut recessed into the material. The gemstones, which were worked on in that way, are also called ‚intaglio‘. The gem, which is already known since approx. 6 millenniums, is the name father for the gemology. Cameos were already cut by the old Egyptians, Persians and Greeks. The ideal materials for it were stones of the quartz group, as chalzedone and sardonyxe (layer stones). Till this day they are still used in the jewellery design, with antique man’s rings, for example, as signet rings. Total diamond weight ca. 0,6 ct. 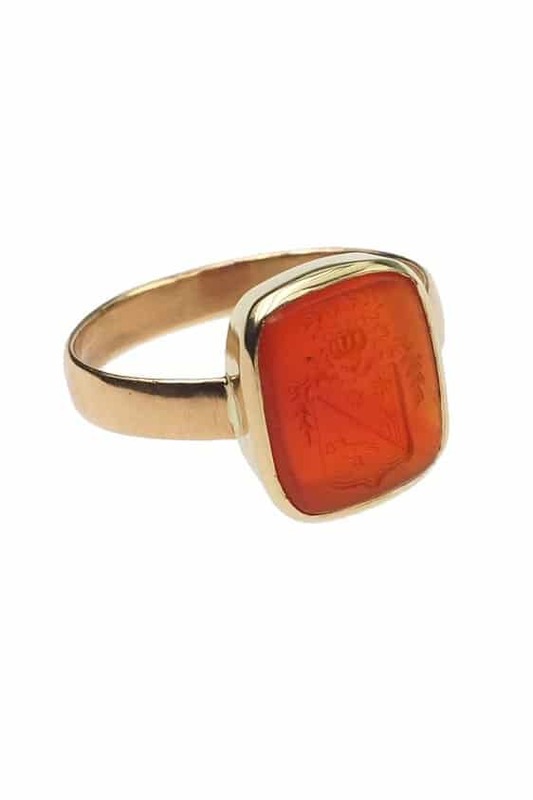 Please note, this ring can only be sized slightly because of the cornelian stone! Intaglio of a family’s coat of arms! Please note, this ring can be sized for maximum 6 German numbers larger or smaller! Hand-engraved family’s coat of arms! Intaglio of a god’s head in profile.